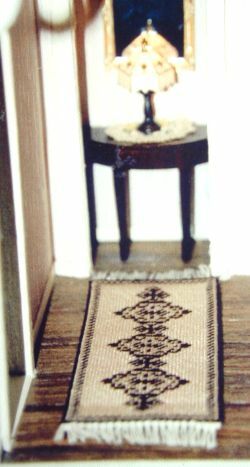 Christmas 2000, and Arlene’s house has been given bedroom and livingroom furniture, including rugs, bedspread and sampler. 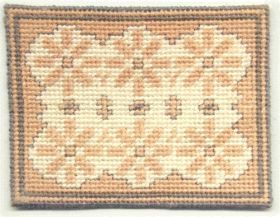 Arlene adapted the “Bathmat” design from the book, using beige wool and omitting the lettering. To make a longer runner in her landing, Arlene ‘stretched’ the “Alison” design, by repeating the central motif. Very effective it looks, too.